Light of Truth Center continues to dedicate itself to serving women in the recovery process by providing housing and recovery support services. Over the years LTC has remained steadfast in ensuring that our “women” come first. With the current opioid epidemic it is paramount that LTC be a place where women can come and regain their lives. Our theme this year is When Love Calls. LTC know that When Love Calls…It answers! We are celebrating 19 years of serving women in the recovery community. 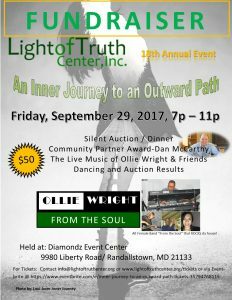 Come and share in the festivities as we honor our Impact Community Partner, Amanda Owens; acknowledge the women who make us possible, bid on amazing silent auction items, and dance the night away! 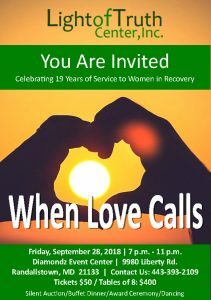 “When Love Calls” fundraiser to be held Friday, September 28, 2018 from 7 pm– 11 pm at the Diamondz Event Center, 9980 Liberty Road, Randallstown, MD 21133.